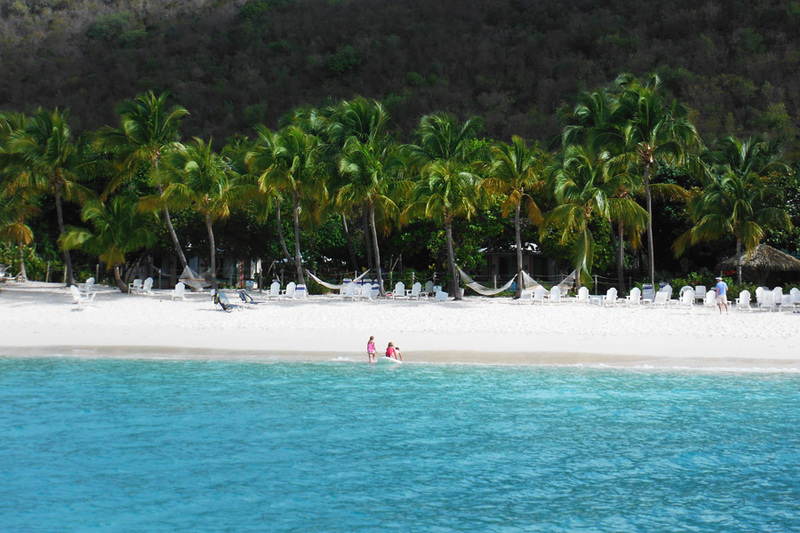 We docked in Deadman's Bay, home to the famous Peter Island Resort and Spa. It was so beautiful and peaceful that I was tempted to stay a night or two and meet the boat later. My sister-in-law and I had massages; the guys went to the beach with the kids and had a drink at the postcard-esque beachside bar. Cooper Island Beach Club, a stunning locale and seaside bar, is easily one of the most magical places I've ever had a cocktail. You need to arrive by 3 p.m. if you want to get a good mooring and snag a cozy beachside sofa. We were a bit late for that, but it didn't matter. They also have a restaurant adjoining the bar that serves lunch and dinner. Make reservations by noon the day of to get in. Allegedly, Christopher Columbus gave the name Virgin Gorda — "fat virgin" — to the island because its profile on the horizon looks like that of a fat woman lying on her side. I won't comment on that, but we did have a great time going ashore and walking through the Baths, the enormous volcanic granite rocks. 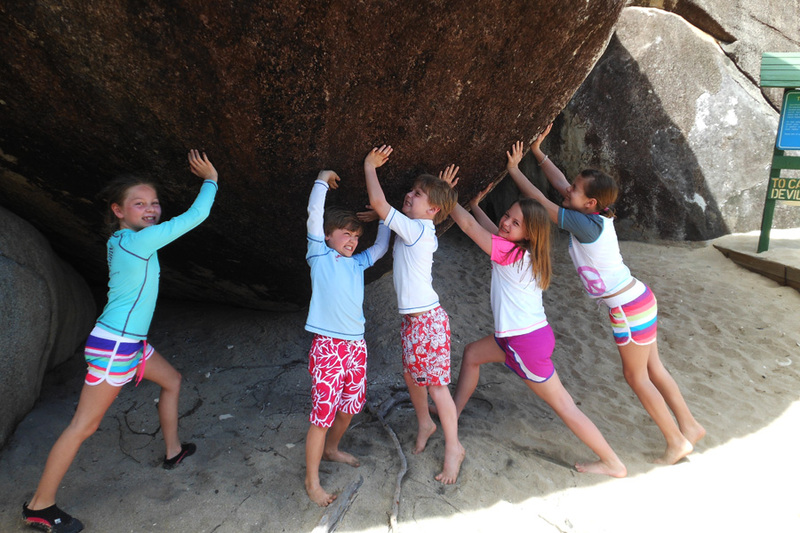 A 20-minute craggy maze led us through scenic grottos, up and through a rocky landscape. 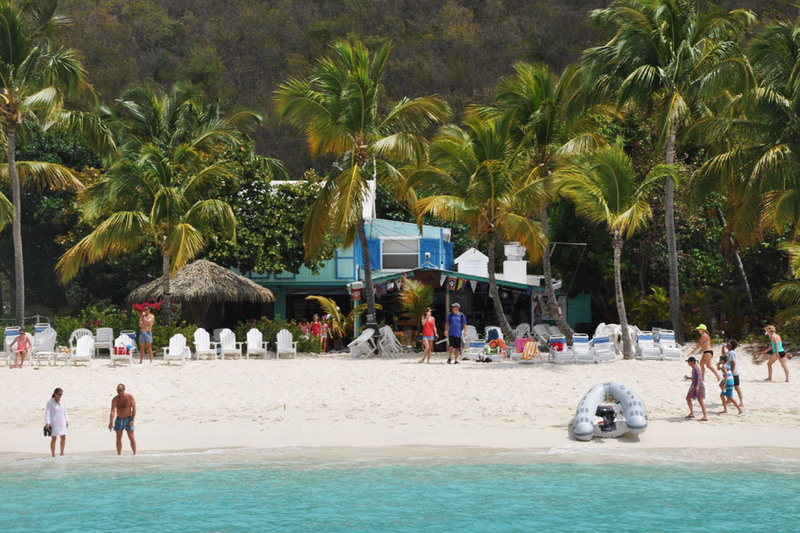 Less relaxing than the aforementioned places, the Leverick Bay marina on Virgin Gorda draws a crowd for a chatty, well known pirate show by island legend Michael Beans. 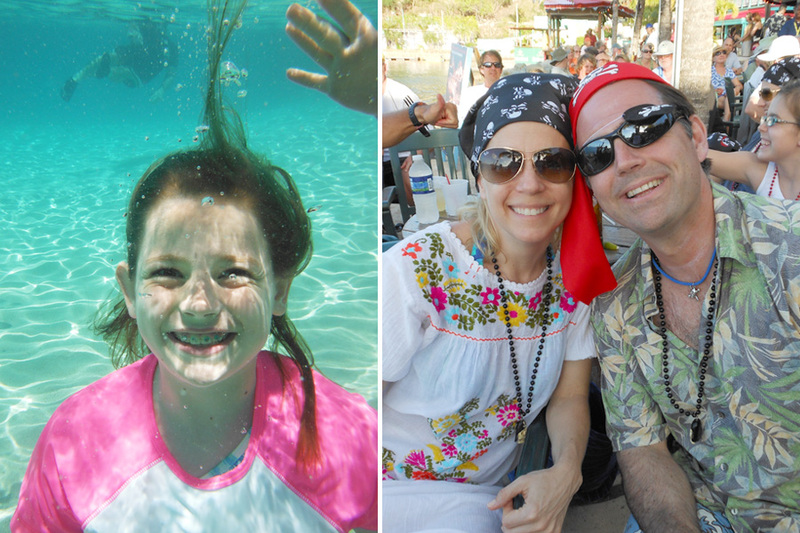 Called — wait for it — "Happy Arrr." This show was the highlight of the entire trip for my husband. After coming the first time, we realized only the rookies don't dress up. Bustling Cane Garden Bay was where we decided to venture onto land. When you need a night of adventure ashore, this is the place. Richard and Adele agreed to babysit our kids while we went for a drink in the hills at the Bananakeet Café, where sunset happy hour runs from 4-6 p.m. and the pina coladas are amazing. We had a fantastic dinner at The Sugar Mill Hotel, a converted old stone sugar mill, that harkens back to Colonial times. It was nice to be on land for a bit and cool to dine amidst ruins. It was our most luxurious dining experience yet, but I still missed Adele's cooking. 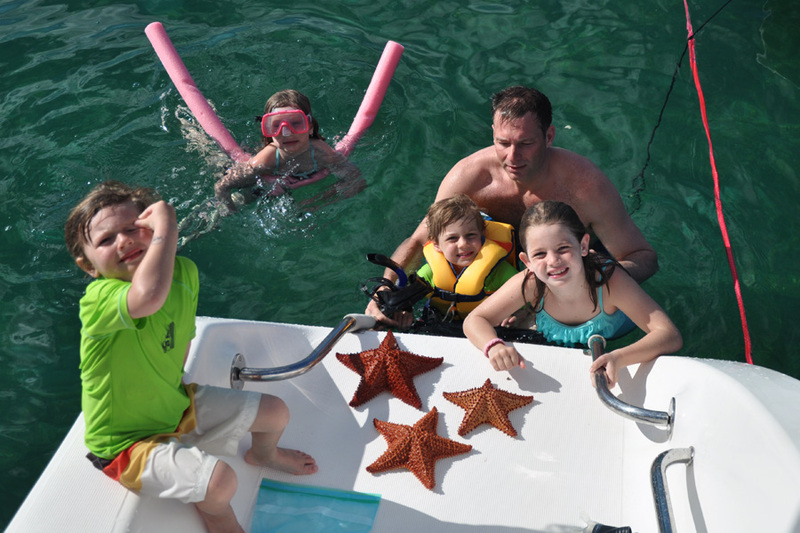 Spend a day at Sandy Cay exploring the hilly island, then head to nearby Diamond Cay for a swim with large sea turtles and, if you're lucky like us, a huge stingray. Another great night spot. We anchored in early afternoon, and things got a bit blurry after we went ashore to the famous Soggy Dollar Bar and had several Painkillers, the house specialty. 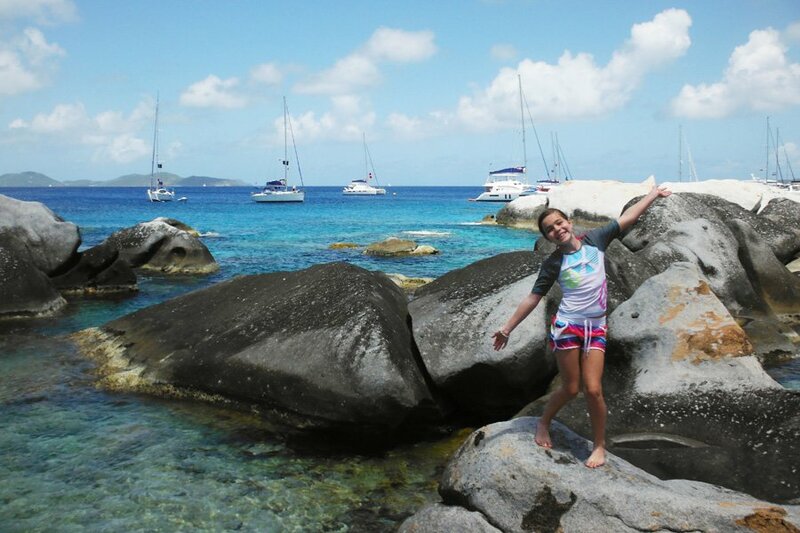 The trip culminated at Soper's Hole, on the west end of Tortola. Strolling ashore and shopping the fun, waterside boutiques and relaxing at the bar has become a mini-tradition for us, if something you've done twice can be counted a tradition. My favorite store, Sunny Caribbee sells tasty island seasonings that make great gifts—Herb Pepper and Caribbee Hot Sauce are their bestsellers. Sadly, ours got confiscated as we flew home, but that is the subject of another piece. We've already booked Yes Dear for April 2014. The easiest way to reach Tortola is to fly to US Virgin Island St. Thomas and take a one-hour ferry ride to Road Town Harbor. There are two ways to do this, and we tried both. Private water taxies are expensive, but reliable; public ferries are less expensive and unreliable. The ferry depot is a short 10-minute taxi ride from the airport (plenty of taxis line up out front) and the ferries run frequently, so no need to book in advance. 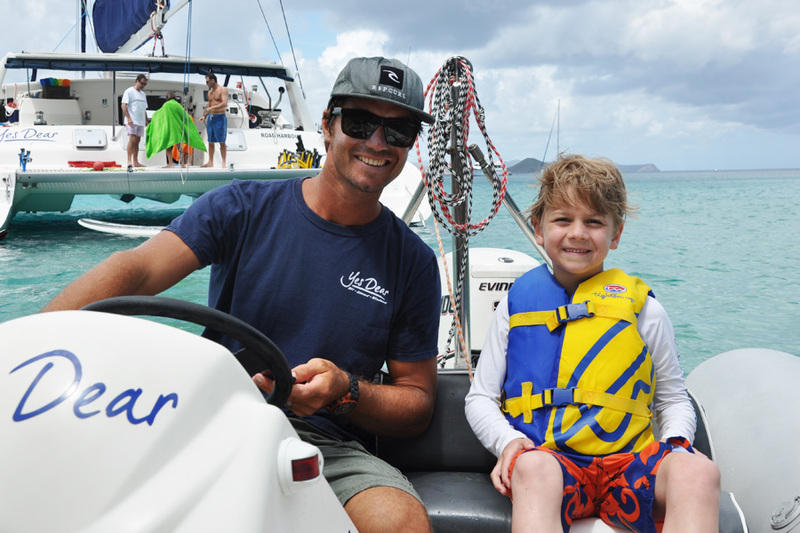 The third option is to fly to San Juan and schedule an air taxi from San Juan right to Tortola. Malia is a freelance writer and mother of three living in New Canaan, Connecticut. She travels for the change of scenery and the bliss of food, culture, exploring, sport, art, and shopping.